Not to turn this space into the NY Times’ “Metropolitan Diary” or anything, but I had a curious and gratifying moment yesterday. I’m currently in Sanibel Island, Florida, where my biggest traffic concern is generally trying to figure out if the thing I can see in the dead tree to my distant left as I drive is a peregrine falcon or a red-shouldered hawk. In any case, at the local bookstore I saw a flyer announcing a pickup-soccer game the following morning (the guy announced he needed a break from “family time”). Being a soccer nut and definitely suffering withdrawal symptoms, I resolved to attend. It turned out I was the only one who did, apart from the three early twenty-something guys hosting it. After an intense first-half of two-on-two, we were chatting in the shade. We were talking about what we did, and I mentioned Traffic, then preparing myself to make the explanatory pitch… Before I could, however, one of the three, Scott, perked up and said “you wrote Traffic?” Not only had he bought and read the book on a plane, but apparently a friend had bought it for him as well (was there ever more rapturous music to a writer’s ears?) We talked for a while about Boston drivers and such, then played a bit longer in the noonday heat, then went our separate ways. I think it was a draw, by the way. Comments Off on Meeting Your Readers. Click here to leave a comment. “The number of road traffic deaths in 2008 decreased by 10.3 percent from 2007. The dramatic decrease is partly due to the increased rate of passengers in backseats wearing seat belts, the NPA said. “In many serious accidents, passengers who were riding in backseats were found to have been thrown through windows. However, statistics show the fatality rate of backseat passengers wearing a seat belt is one-fourth that of those who do not wear a seat belt. Currently, drivers receive a penalty point only when their backseat passengers do not wear seat belts on expressways. However, the NPA is considering penalizing drivers whose passengers do not wear seat belts on all roads. Comments Off on Backseat Buckling. Click here to leave a comment. 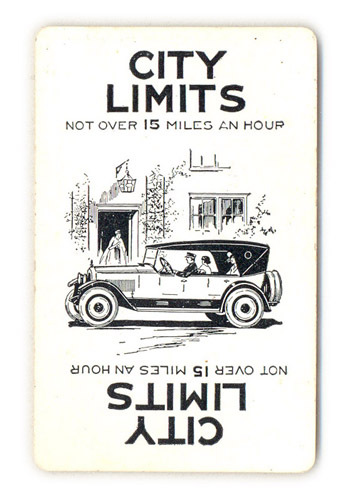 From the delightful “automobile touring game” chronicled over at things magazine. Comments Off on Those Were the Days. Click here to leave a comment. That’s a snippet from David Lida‘s First Stop in the New World: Mexico City, Capital of the 21st Century. I have been to the city many times — and on the most recent trip was delighted by the car-free Sundays program in the center — but this book deepened my knowledge and appreciation. Comments Off on El D.F.. Click here to leave a comment.